What a Year for GJB! So as we come to the end of the year I thought it was the perfect time to do a final GJ blog before the excitement of 2018. As always there is a lot to tell as we have been busy bees since the last post in August and just haven’t had the chance to sit down and compose the news. However, this is just how we like it as we love nothing more than spending our time with all of our beautiful brides to be. Now where to start since we left off in the Summer. Well, since those lazy, hazy warm days where the weather may have got cooler things continued to hot up at the boutique. We held a fabulous September sample sale which was a huge success. These events are a perfect opportunity for any brides with slightly shorter time scales until their weddings or for ladies who want to purchase a stunning designer gown at a discounted price. The dresses we stock tend to range anywhere between £1000 - £3500 and a sample sale dress is a gown that has been discontinued from a designers collection and therefore cannot be re ordered. Therefore we usually sell these between approximately £500 - £1000 which is fantastic value as the dresses are always kept in super condition. 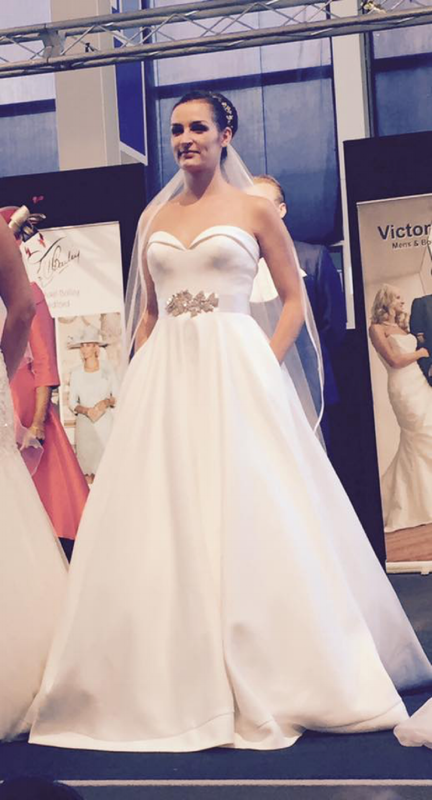 Needless to say the popularity of these events are huge and we were delighted that so many lovely ladies found their dream dresses. September also brought with it my year wedding anniversary and my goodness I couldn’t believe how quickly the year had flown. It always serves as a reminder that you need to get planning for your wedding well in advance and we usually recommend a year beforehand is a really good time to start looking for your dress. The Autumn is also the time when wedding fair season kicks back in and we absolutely love attending fabulous local fairs. We are normally found providing the dresses for the catwalk shows and it is a great opportunity to come along and get some inspiration for the big day. We also love meeting brides to be with their family’s and often fiancés as it allows us to connect personally rather than when the bridal party first comes to the boutique. 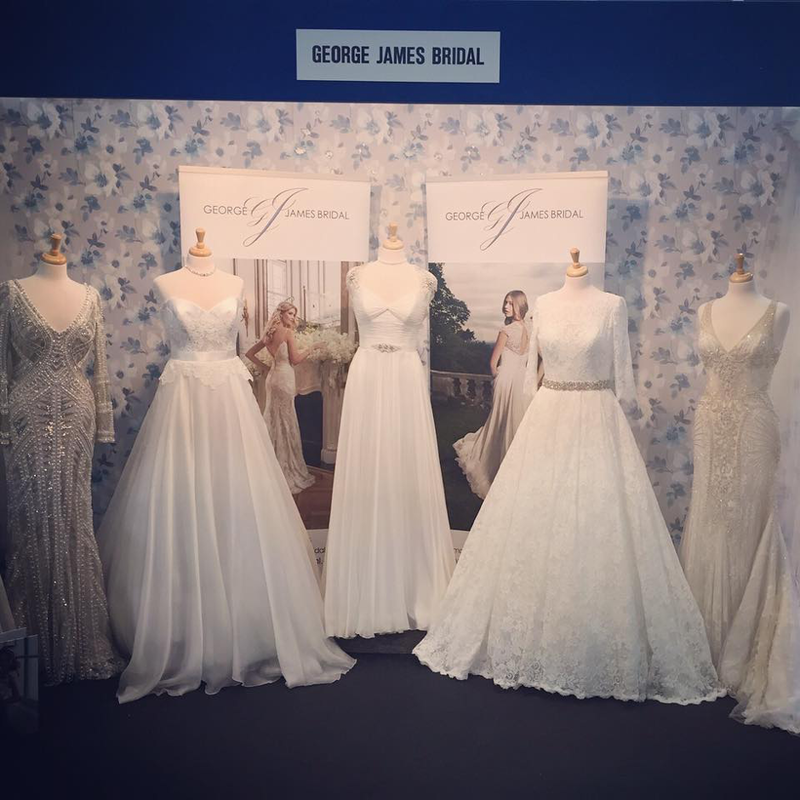 We exhibited at the Affinity Wedding showcases at The Swan in Bedford, Wyboston Lakes, The Sculpture Gallery at Woburn Abbey, The Sharnbrook Hotel and The big 3 day wedding fair at Centre MK held by Central Exhibitions. There is a little pic of this event along with one of me and my parents as they have been so supportive and I wanted to say a big thank you. I think my dad has got himself quite the reputation as part of the GJ team now as you can often find him assisting at the fairs. I am beginning to think he knows more about the dresses than I do! 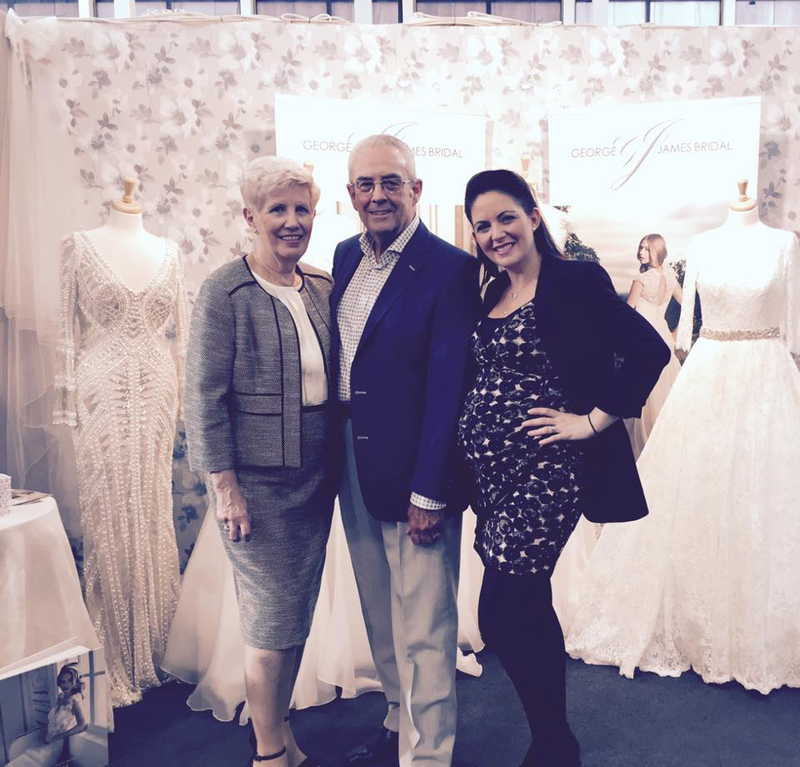 Along with wedding fairs we also hold several designer weekend events throughout the year and we were thrilled as always to have the new collections in from the fabulous Justin Alexander and Lillian West. Again, this is another superb chance for bride to be to not only have a preview of the next seasons collection before it is released in the bridal boutiques but there is also the opportunity to purchase you gown with a 10% discount should you find ‘the one’! This is also an event which tends to be fully booked and we were so happy that once again so many lovely ladies found their perfect choices for their special days. We then had an exciting announcement in October as we are now stocking the fabulous collection from world renowned designer Maggie Sottero. It is such an incredible label which is a firm favourite with many brides to be. We have received several of the lovely creations and are looking forward to more arriving in the new year. The Maggie Sottero collection is inspired by today’s classic bride, channelling ethereal grace but designed for modern romance the core collection features shimmering embellishments and lightweight fabrics in a variety of captivating designs. We are really looking forward to seeing what you all think of this wonderful new collection. As you all know we have been overwhelmed and honoured to have won several awards in the past and this year things got better and better with our winning streak. 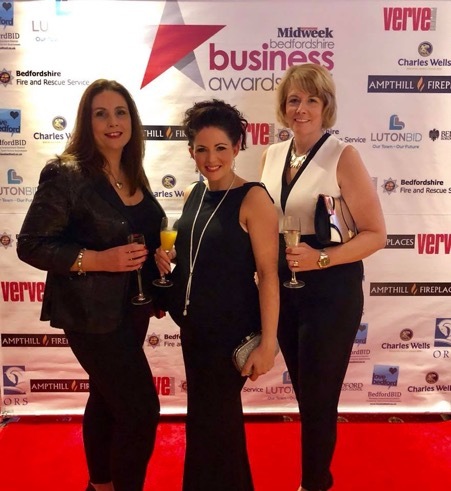 We were so happy to take home the title of Bedford Town Centre Business of the Year at the Bedfordshire Business Awards and I loved having my GJ team with me at the event. I am proud to have an established business in the heart of the town and can’t thank all the lovely locals enough for their support. 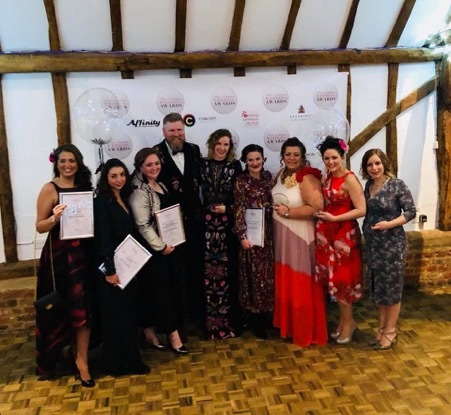 In the past we have taking the title of Best Newcomer and Highly Commended at the fabulous Four Counties Wedding Awards but the real biggie is Best Bridal Retailer and we were beyond thrilled to win this year. All the awards mean a great deal but this one in particular is very special as much of the judging is based on votes and reviews from the brides. Our aim has always been to provide a special experience for our customers regardless of whether you buy a dress with us or not and knowing that you have all had such magical memories with us means the absolute world. We were also so pleased for our fabulous fellow industry suppliers who also took home a variety of awards on the night. This included Bella Occasions, Cat Lane Photography, Love from Becky, Alison Kynoch, Kate Atalay, The Vintage Suit Hire Company, The White Emporium and Sarah Brookes Photography. I simply love being connected with such talented people and Tracy Butterfield the founder of WedX and 4CWA has provided us all with a wonderful platform to network and showcase what we all have to offer. Huge love to you all! We didn’t quite make the hat trick of wins but we had a fabulous night at the finals of the National SME awards held at Wembley Stadium. To win Service Excellence at the local awards was such a great achievement and to be alongside some great businesses at the Nationals was a real honour. If it wasn’t for the baby bump I would have been out on the pitch!! After all the awards excitement it was back to work which also included having a wonderful new website created by the immensely talented team at Lucky 14. We have been wanting to have a new look website for quite some time and we are absolutely thrilled with the result and we hope you like it as much as we do! So all that is left to say is HUGE congratulations to our incredible 189 brides who got married in 2017. I have seen so many stunning pictures and received an overwhelming amount of thoughtful thank you cards and amazing gifts. We are so delighted that we could help in a small way towards all of your bid days and we hope you are all enjoying married life! As many of you have seen I also have some very exciting news as I am due to give birth to our first child in January! I will of course keep you all updated and no one need fear about the running of the shop as my super sisters Michelle and Samantha will be in taking over and you will all see more before you know it. I hope that you all have a wonderful Christmas and New Year and to all the 2018 brides enjoy the build up to the most wonderful day of your lives. We can’t wait to see all the newly engaged ladies in the upcoming months and we send all of our love and best wishes to you all as always.